Alaska's standing bear license plate has won the 2015 Best Plate Award from the Automobile License Plate Collectors Association. Members commenting on the plate at the group's website praised it as "Beautiful, legible, retro and modern all at the same time," "Simple, elegant, memorable and easy to read," "A rather simple design with a clearly understandable message (Come to Alaska and see fantastic wildlife)" and "One of the most identifiable graphics on any plate since the introduction of graphics." The plate featuring a bear illustration by famed wildlife artist Douglas Allen was originally issued in 1976 in conjunction with the American Bicentennial. It was discontinued a few years later after jokes about the bear looking like a squirrel or something less appealing became more than certain legislators could, um, bear. Allen's bear reappeared as a license option in 2015 after a lobbying campaign by Ketchikan resident Jerry Cegelske. The resurrected design was tweaked by Anchorage graphic artist Marie Conover. Allen, who lives in New Jersey, did not know that his image, which first appeared in a book printed in the 1960s, was used for the original plate. But Palmer resident Greg Bill had spotted the connection. When it was announced the bear plate was coming back, Bill notified Allen, who sounded amused when he spoke with Alaska Dispatch News. "It happens all the time," he said. People have often put his art on tourist items, bottles, glasses, rugs and such. "I'll walk into a shop some place and see one of my pieces and say, 'Now, that looks familiar.'" Since its reintroduction, about 75 percent of general-issue plates and 40 percent of personalized plates have featured the standing bear. Some owners of personalized plates have even figured out ways to incorporate the bear, which occupies the center of the design, into their rebus, i.e. "RAZ(bear)RY" or "UN(bear)ABL." Gus Oliver, former director of ALPCA and the contest coordinator said the original bear plates "have always been beloved by the plate collectors. 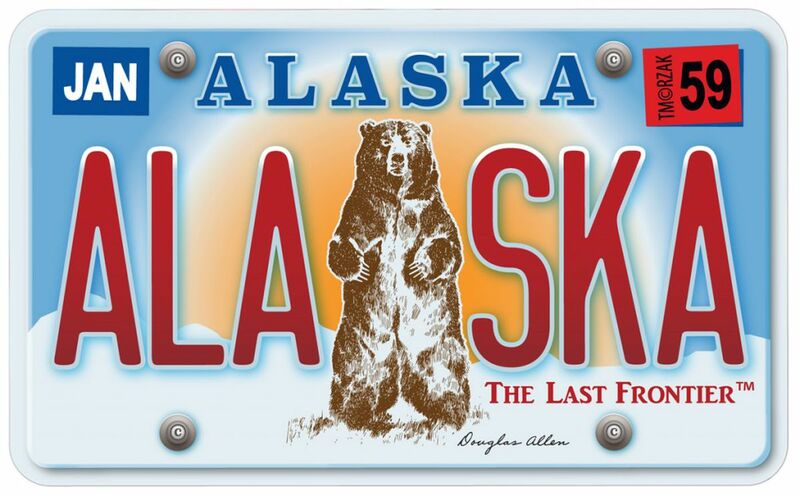 Of all the regular issue license plates, the 1976 Alaska Bear Plate is probably the most coveted and most valuable." One in mint condition will sell for $40 or more. ALPCA members were asked to pick their three favorite license plates from the United States and Canada on the basis of attractiveness and legibility. A first place choice was worth five points, a second place choice worth three points and a third pick was worth one point. "Alaska had more first, second and third place votes than anyone else," Oliver said. North Dakota, the only other competitor to feature an animal, a bison, came in second. The very plain – "retro" in license collector speak – California plate was third. Tennessee, Saskatchewan, North Carolina and West Virginia followed in the vote. About 500 people from the group's 2,710 members voted in the competition. That's about the same number as Oliver expects to show up at the annual convention, scheduled for Fort Wayne, Indiana July 20-23. "They're the hard cores," he said. Alaska previously won the ALPCA poll in 1998 for the state's Gold Rush Centennial plate.